Hello friends we know very well that at present time billion of users have to use WhatsApp facility in his Smartphone. There are lot of tips and tricks which you use in your Smartphone which helps you very much but due to the absence of knowledge most the person don’t use these tips and tricks. Today we discuss another important trick from which you will be able to easily modify or charge your wallpaper on WhatsApp chat. Lot of time you seen a decorative wallpaper of your friends or any other person on WhatsApp chat window. It gives a attractive look and anyone want to know how they set wallpaper on the WhatsApp chat window. After reading this article you will be able to easily set or change the WhatsApp wallpaper by applying few easy steps which is given below. If you have an Smartphone and running WhatsApp application to communicate with different persons who is already added in your contact list and now you want to set and wallpaper in the WhatsApp chat window to give stylish look then you have to take few simple steps and then after your WhatsApp chat window also decorative with your required wallpaper. Step 1: Start the WhatsApp application on your Smartphone. Step 2: You will get different options now you have to tap on the “Settings” option. Step 3: In the “Settings” window you have to tap on the “Chat Settings” option > Now, it will open an another window in which you will get different options. Step 4: Tap on the “Wallpaper” option in the Chat settings window > Tap on the “Gallery” option in the Wallpaper window and select any required wallpaper which you want to set on the WhatsApp Chat window to give attractive look > Finally press OK button. Now, you will see your selected wallpaper is set on the WhatsApp chat window. 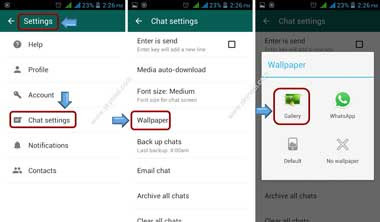 If you already set any wallpaper on your Smartphone WhatsApp chat window and now you want to remove that wallpaper then you have to take few given easy step to easily remove WhatsApp chat Wallpaper from your Smartphone. Step 4: Tap on the “Wallpaper” option in the Chat settings window > Now, Tap on the “No Wallpaper” option > Press OK button. Now you will check that WhatsApp Chat Wallpaper is removed from the Smartphone. I hope you like this article. after reading this article you will be able to easily set or change or remove any wallpaper on your WhatsApp window. Share your knowledge with others and give your important suggestions in the comment box. Thanks to all.